PLEASE NOTE: UNLESS INDICATED, YOU WILL NEED TO BRING YOUR OWN MACHINE TO CLASS. YOU DO NOT HAVE A MACHINE, WE HAVE A LIMITED NUMBER OF MACHINES AVAILABLE TO RENT FOR A SMALL FEE. PLEASE LET US KNOW UPON REGISTERING IF YOU WILL NEED TO RENT A MACHINE. for a different class. Suddenly Sewing may cancel classes due to lack of enrollment. Store Credit will be issued to registered students or we can enroll you in the next available class. 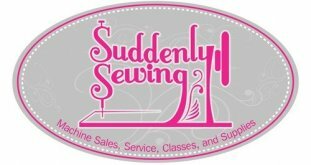 Purchase your class supplies at Suddenly Sewing and receive a 10% discount.